It'is located between Piazza Venezia and via del Plebiscito . In 1455, Cardinal Pietro Barbo began construction work to make it as his residence. The work continued even after the election the cardinal as pope with the name of Paul II, so the palace, suitably enlarged, became the seat of papal. During the years of the pontificate of Paul II, the building, which had incorporated in its architectural fabric of the adjacent Basilica of San Marco underwent significant changes with the construction of the building along Via del Plebiscito, that of the Palace of the future Palazzetto Venezia and, inside, the famous Hall of the Globe, probably decorated by Mantegna. the threshold of the sixteenth century, Cardinal Lorenzo Cibo enlarged it modified it further with the creation of so-called Flat Cibo, who between 1564 and 1797 was home to the Cardinals owners of San Marco. In that same period the building was owned by the Republic of Venice, who used it as the residence of his ambassadors, further altering original structure XV. Increased efforts were the next two centuries until in 1916 the building was used as as a museum. After 1929, Mussolini fixed the seat of the Grand Council of Fascism. The building and the courtyard was built by architect Leon Battisti Alberti. For the most part is home to the National Museum of Palazzo Venezia, which is also developed in the adjacent "Arena Venice", made ? ?communicating with the main structure through the so-called "Corridor" or "Hall of the Cardinals". 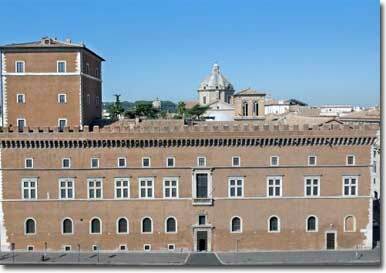 Contains a rich collection in part derived from the former Museum Kircheriano and especially from Castel Sant'Angelo. The art material consists mainly of works of medieval and renaissance eras. Pottery, porcelain, silver, bronze, vestments, wooden sculptures, paintings, ivories, weapons, tapestries and crystal production, both Italian and foreign, fill several rooms which make up the museum. iniziò la costruzione nel 1455 per farne la propria residenza. Dopo la sua elezione a pontefice (Paolo II) lo ampliò con il palazzetto Venezia. Lorenzo Cybo (Cardinale) lo ingrandì e lo modificò con la creazione del cosiddetto Appartamento Cybo. Giulio Da Maiano (Pittore) Scolpì il portone principale del palazzo. Francesco Cozza (Pittore) con il dipinto "Fuga in Egitto". Francesco Di Cristoforo said Franciabigio (Pittore) con il dipinto "Madonna con Bambino e san Giovannino" databile nel periodo 1506 - 1525.